5 days from conception to completion. I questioned if I could do it or not. There was a call for art for this book that I heard about. I emailed the woman in charge and told her I was interested. She informed me that the deadline for the initial entry had been a month previously. Dang! I had gotten up the courage to submit and this was my response. I apologized for being late and told her that I felt the Universe had guided me to her and this was my first ever submission to a magazine/book. She proceeded to followed up with the word BUT, which is an interesting word that can indicate many conclusions. She said someone had just backed out and she would accept my art if I could have it to her within 5 days to meet the art submission deadline. The art was to be created around a choice of one of two quotes. I told her that my word for 2014 was YES, therefore, I would accept the challenge. With a chuckle in her voice she said, "you are really going to like one of these quotes". When I received the quotes, I heart smiled within. She was right. I recalled pleasing with the Universe saying out loud, "OK, Universe, help me with this one!" My intention was to create something original. For 3 days I worked on my art and on the 4th day it was completed. I was pretty darn pleased with the results. I took photos and submitted it. Within a week I found out that I had not been accepted into the book. It's peculiar because when I got the news I wasn't crushed. I will admit that I was just a little disappointed, yet not crushed. I learned much from the experience about myself and my capabilities. I overcame the obstacle of submitting my art. Even tho I was not accepted I didn't feel defeated. If anything the whole experience has lifted me to another level on this creative journey. She suggested that I wait for another month before publishing it online anywhere in case she did another book and I could re-submit. I've waited now for over a month and decided to share my finished piece. 11" x 14" and is made on a sheet of canvas panel. The background began by first layering with drywall tape, adding multiple layers of paint while utilizing several techniques to apply the paint. 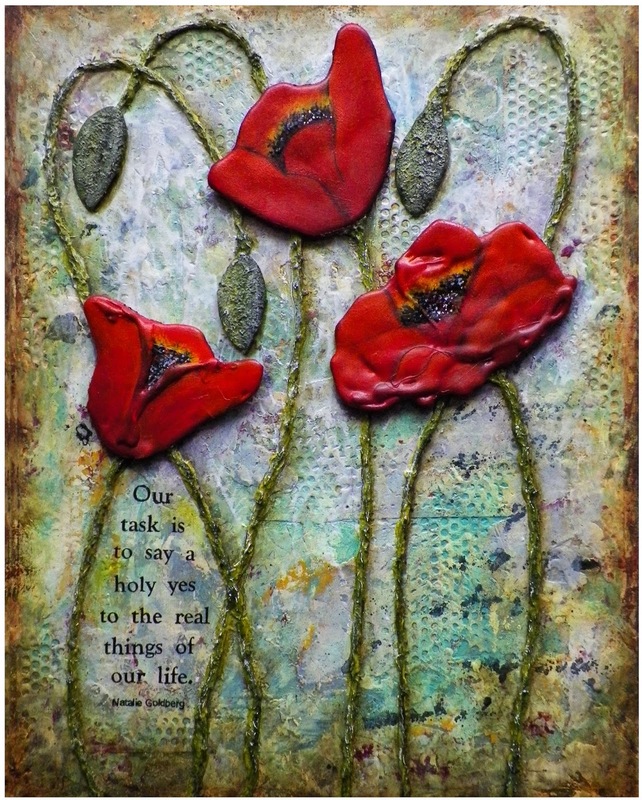 The beautifully colored poppies along with the buds and stems are all made with hot glue. Yes, I said, Hot Glue. The poppies look 3D because they are. I adhered them to the stems so they "pop" right out at you. Have you been to my store, yet? Come on over and check it out. You may find something that is unique and just the right gift for someone. Mother's Day is right around the corner.